We guess this makes up for the fuel used by the 8.0-liter Bugatti that's also in the fleet. The Dubai police force and LAPD can both now claim that they have something in common: both departments now feature the electric and optionally range-extended BMW i3 in their respective fleets, as Bloomberg claims. When Los Angeles police got ahold of these cars, it was not exactly a huge surprise given California’s eco-conscious culture that renders it the only state where you can obtain a hydrogen Toyota Mirai and the number one electric car buying state by a long shot. Dubai, on the other hand, could not be in greater contrast to California, and we’re not talking about the philosophy of peace, love, and happiness butting heads with Sharia law. The Middle Eastern city is a symbol of the opulence brought about by oil wealth and Dubai’s police force is famous for putting it all on display with fleet vehicles like a Bugatti Veyron, Ferrari FF, Bentley Continental GT, Lamborghini Aventador, Mercedes SLS AMG, an ultra rare Aston Martin One-77, and a Chevrolet Camaro. At least these bode well for pursuit purposes given that the new i3’s top speed is only 95 mph and its range is only 114 miles before the gasoline range extender needs to kick on and replenish the cells. 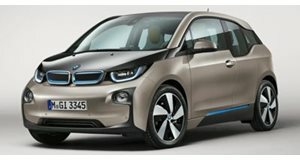 Unfortunately for pursuing officers, Dubai only bought the fully electric version of the i3, meaning that once all 114 miles have been run through, the gig is up. No mention on whether the extreme heat in the region puts a damper on that range. It’s limitations like these that led the Los Angeles Police Department to designate the i3 as a shuttle for officers that aren’t on street duty. While it’s unclear what the Dubai police force will use the i3 for, we do have insight into why it didn’t go with the range extended option or even its more fitting hybrid sibling, the i8. And no, it had nothing to do with trying to cut costly corners and save up for a $3 million Bugatti Chiron. Instead, it's because the UAE is planning to have electric vehicles make up 10 percent of all government vehicles in order to help reduce carbon emissions by 15 percent by 2021. Given the contents of the rest of the fleet, we can see why the Dubai police force needs all the help from electric vehicles that it can get.